Welcome to Wheel Anatomy 101. Today we will be reviewing the major structural aspects of automotive wheels, focusing on the outboard, or structural face of the wheel. Students, if you will all take your seats, we can begin the class. The outboard face is the part of the wheel you can see when it is bolted to the car. We often refer to it as the “cosmetic face” but it is also the structural face of the wheel since the other side is essentially required to be an open cylinder. This makes the outer faceless directly vulnerable to impact damage since it is simply easier to bend the open cylinder than the structure, but it can also make the damage that does occur a lot worse. Structurally, the empty space inside the center bore is one of the most important points on the wheel. This hole fits over the end of the axle when the wheel is bolted on. It is this fit between the axle seat and the center bore that truly holds the weight of the car, as lugnuts only serve to keep the wheel on the axle. For this reason, OEM wheels are made to fit closely on the axle seats of their designated cars. 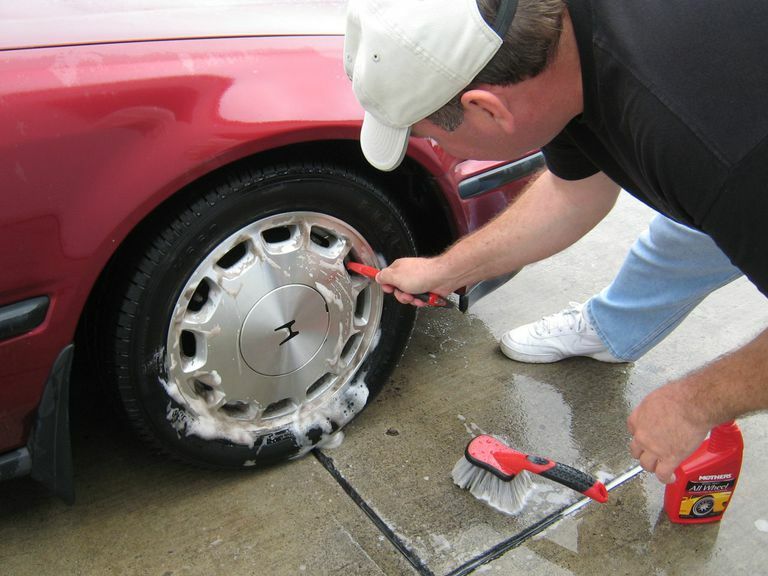 When buying aftermarket rims, care must be taken to ensure that the center bore is the same or larger than the OEM size - large enough to fit over the axle. Most correct aftermarket wheels will have center bores that are larger than the OEM size, and so the gap between must be filled by “hub-centric spacers” to avoid damaging both wheels and lug nuts. Around the center bore there is generally a substantial piece of metal interrupted only by the bolt holes. We call this the plate. The plate is the core of the wheel, the point of contact to the axle seat, the lug bolts and the lateral surface of the rotor. Everything else on the wheel is connected back to the plate. In essence, the spokes are the structures between the plate and the outer edge of the wheel. They are designed to tie the wheel together, support the outer edge and resist impacts. Spoke designs vary wildly, from the classic 5-spoke patterns to intricately overlapping multiple “Y”-spoke extravaganzas. It's important to note that the strength and damage resistance of spoke designs also vary because if a spoke gets cracked by an impact the nature of the structural relationship is such that attempting to repair it by welding would be unwise and possibly dangerous. Although it also refers to the outer part of a 3-piece wheel, the dish is generally thought of as that portion of the wheel that comes out beyond the spokes. A wheel where the spokes are sunk inches below the lip is a “deep-dish wheel.” Deep-dish wheels are mostly made for looks, with the extra space being used to showcase a polish or other nice finish. However, the deeper the dish, the more vulnerable the face of the wheel is to impact damage, as that outer rim is hanging out in space. The more distance from the spokes, the more leverage an impact has to bend that outer rim, or in the worst case, fold the dish against a spoke and crack it. This kind of crack is also not safe to repair since the repair is inevitably weaker than the original and can fail catastrophically. The bolt circle is the circle described by the centers of the lug bolts. Its diameter is inexplicably called the Bolt Circle Diameter, or BCD. The number of bolts plus the BCD comprises the bolt pattern so that 5 lug bolts at a 4.5 inch BCD can be described as a 5x4.5” bolt pattern. Bolt patterns vary between car makers, sometimes even between model lines. For example, most BMW wheels are 5x120mm except some very early 4x100mm models, while almost all Mercedes wheels are 5x112mm, which is why you can't cross fit wheels from one to the other. Somewhere on the wheel, a small hole must be drilled for a valve stem, that universal mechanism by which we fill our tires with air. Just that small hole will often make one side of the wheel lighter than the other side – enough so that a good spin balancer will often have to compensate for it. Valve stems range from the good old-fashioned snap-in rubber stems to fancy metal stems with rubber gasket seals to the current mandated explosion of TPMS modules with valve stems on them. This completes our module on the structural aspects of automotive wheels. Thank you for your attention, and please join us next time for Wheel Anatomy 201, which will concentrate on the outer barrel and energy transfer points of the wheel. What Are the Best Aftermarket Wheels to Dress Up Your Car?